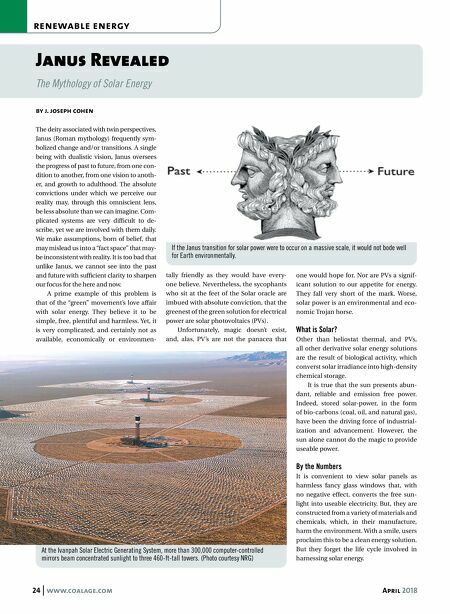 24 www.coalage.com April 2018 renewable energy Janus Revealed The Mythology of Solar Energy by j. joseph cohen The deity associated with twin perspectives, Janus (Roman mythology) frequently sym- bolized change and/or transitions. A single being with dualistic vision, Janus oversees the progress of past to future, from one con- dition to another, from one vision to anoth- er, and growth to adulthood. The absolute convictions under which we perceive our reality may, through this omniscient lens, be less absolute than we can imagine. Com- plicated systems are very difficult to de- scribe, yet we are involved with them daily. We make assumptions, born of belief, that may mislead us into a "fact space" that may- be inconsistent with reality. It is too bad that unlike Janus, we cannot see into the past and future with sufficient clarity to sharpen our focus for the here and now. A prime example of this problem is that of the "green" movement's love affair with solar energy. They believe it to be simple, free, plentiful and harmless. Yet, it is very complicated, and certainly not as available, economically or environmen- tally friendly as they would have every- one believe. Nevertheless, the sycophants who sit at the feet of the Solar oracle are imbued with absolute conviction, that the greenest of the green solution for electrical power are solar photovoltaics (PVs). Unfortunately, magic doesn't exist, and, alas, PV's are not the panacea that one would hope for. Nor are PVs a signif- icant solution to our appetite for energy. They fall very short of the mark. Worse, solar power is an environmental and eco- nomic Trojan horse. What is Solar? 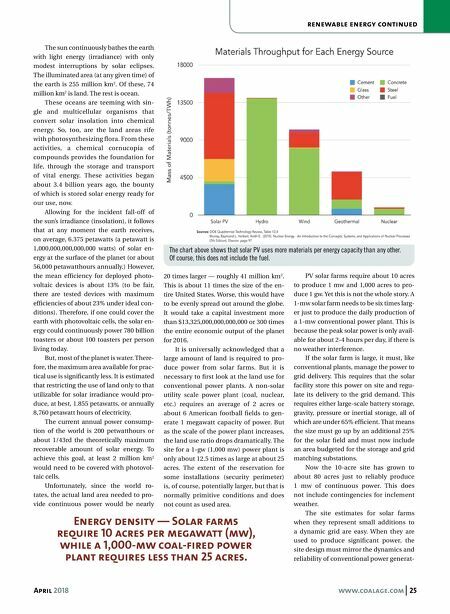 Other than heliostat thermal, and PVs, all other derivative solar energy solutions are the result of biological activity, which converst solar irradiance into high-density chemical storage. It is true that the sun presents abun- dant, reliable and emission free power. Indeed, stored solar-power, in the form of bio-carbons (coal, oil, and natural gas), have been the driving force of industrial- ization and advancement. However, the sun alone cannot do the magic to provide useable power. By the Numbers It is convenient to view solar panels as harmless fancy glass windows that, with no negative effect, converts the free sun- light into useable electricity. But, they are constructed from a variety of materials and chemicals, which, in their manufacture, harm the environment. With a smile, users proclaim this to be a clean energy solution. But they forget the life cycle involved in harnessing solar energy. At the Ivanpah Solar Electric Generating System, more than 300,000 computer-controlled mirrors beam concentrated sunlight to three 460-ft-tall towers. (Photo courtesy NRG) If the Janus transition for solar power were to occur on a massive scale, it would not bode well for Earth environmentally.